December coincident indices from the Philadelphia Fed are out. Time to re-evaluate this assessment from a year ago in Political Calculations that California was in recession. The release provides an opportunity to revisit this question (the December employment figures are discussed here). 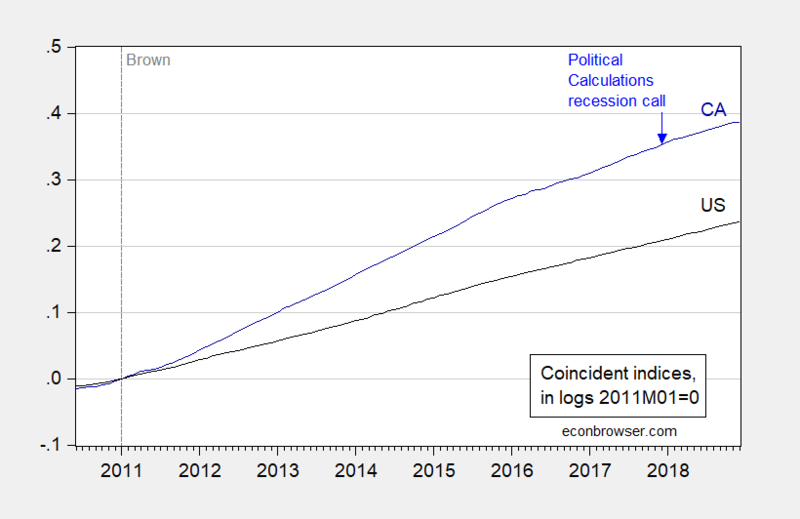 It’s (still) unlikely that a recession occurred in 2017. However, growth has decelerated at the end of 2018. It would be nice if we had the leading indices to look prospectively; the Philadelphia Fed’s leading indices was scheduled for release on January 4, but was postponed due to the Federal government shutdown. Out here in the Gamma Quadrant of the Mid Sierra Foothills it is very depressing as it will rain for the next four days. Also to cap that my wife has abandoned me to go skiing. Then she will go to Silly Con Valley babysit the wonder child. She is depressed that she will miss the wonderful skiing on new snow next week. Home Alone!!! STAY AWAY!!! It is very depressing in California. It’s been mid 60’s most of the week. High 40’s at night. An hour away, snow is 12-15 feet deep. Depending on your forecast(er) another 3 or 5 maybe 7 feet expected through Monday. 3 to 5 inches of rain, which, sadly, will be diverted to the ocean. And to various local reservoirs. You’re on, dilbert . Very depressing. BTW, California’s congressional delegation is asking for updates on administration’s plans on thinning and prescribed burns in the 18 national forests here. Very little was done—especially with private contractors— during the shutdown. Another UCLA Professor, talking about international trade, and some of the things donald trump is not properly conceptualizing about the American trade deficit. This guy has a better start out of the gate, so I’m just gonna put the link from the start. This one is more OVERALL look at USA and not just California, but still worth a watch. Menzie can probably skip this, but people on my level might find it edifying. Moses Herzog: Can’t go wrong listening to Ed Leamer. And everybody who reads this blog should read his “Let’s take the con out of econometrics”. Love the Star Wars intro. Last March 1 I wrote: Begun the Trade War Has! It is over an hour long but worth. Brad did pretty well while Stephen Moore packed in a ton of lies! As far as your Cali blues are concerned, get yourself a full-bottle of bourbon and some meat to help your tummy absorb the alcohol (a bucket of KFC if you’re lazy and don’t mind highway robbery prices, or cook up some cheap $6–$7 chuck-eye steak on the oven, if you’re cheap and can stand over an oven about 12 minutes). Pop in your favorite disc or Netflix. Bourbon or vodka always works for me, (no more than one glass until you finish cooking). Before you know it, 12+ hours has passed by and you got a really good sleep. Last UCLAAnderson video link, any others you good people will have to hunt out. This is David Shulman of UCLA. Also pretty good stuff. Lots of charts. Good ones. Of course if there were the CPI, Stephen Moore would be screaming DEFLATION! Unemployment rate edged up to 4.0 percent, the U.S. Bureau of Labor Statistics reported today. Job gains occurred in several industries, including leisure and hospitality, construction, health care, and transportation and warehousing. Establishment survey data have been revised as a result of the annual benchmarking process and the updating of seasonal adjustment factors. Also, household survey data for January 2019 reflect updated population estimates. See the notes beginning at the end of this news release for more information about these changes. Yes the employment survey showed a good gain in employment. But the household survey showed a decrease. But wait the employment to population ratio rose from 60.6% to 60.7% as measured population actually fell. So why did the unemployment rate rise? Oh – the measured labor force participation rate rose. Better check those notes at the end of the release! When we do Part X, could we always attach the link of previous Part IX, IIX, … in the current post for easy reference? Could we start looking State by State, County by County, at least those in the lower and higher 15% spectrum? If this is going to take too much time, you should actually teach these blog posts in the classroom. Make the hobby your job! — And the world needs this level of analysis. Zi Zi: Or you could just go to the “California” category in the Econbrowser menu. To my knowledge, the Philadelphia Fed does not compile sub-state level coincident indices. I do teach some of these blogposts in my classes, those having to do with macro, trade (since I teach those subjects), sometimes applied econometrics. Then you should do it. Start your own blog and cease telling other bloggers want they should write. Or has Trump decided to make Menzie your slave? Have you ever taken a jaunt down to your nearby Starbucks and in outraged tones demanded that they start serving coffee?? The employees have taken classes on how to stay calm during such rants. Plus they are told to write ZeeZee on his cup of Joe!